The consequences of inflammatory lesions in the pulp and periapical tissues (Fig. 1.1) tormented humanity for thousands of years. Historically, therefore, the main task of endodontic treatment was to cure toothache due to inflammatory lesions in the pulp and paper (pulpit) and periapical tissues (apical periodontitis). Over a long period of time, commonly used method to resolve the painful pulps was etch fabric with a red-hot wire or with chemicals such as acids. In 1836, arsenic was presented to devitalize the flesh, the method to be used during more than 100 years. Procedure to remove pulp without the use of toxic chemicals were introduced at the beginning of the 19th century and small, hooked instruments were used. The emergence of local anesthesia in the early 20th century made pulpec-tomy painless procedure. 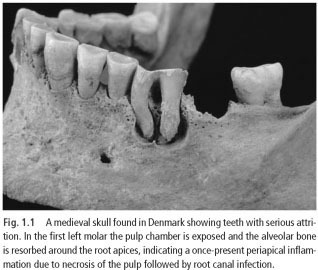 Signs of infection root canal, such as abscesses with fistulas were also historically the use of highly toxic chemicals.